If the current riot clear-ups have got you in the mood for tidying, maybe you'd like to learn some more advanced cleaning skills. 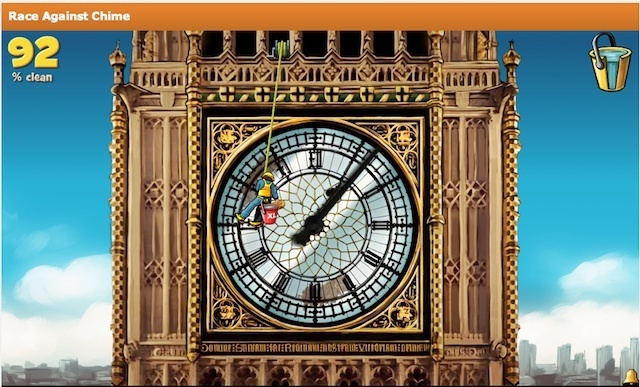 Big Ben needs a shine in Race Against Chime, a momentarily amusing and mildly educational game on the UK Parliament website. Each round, you must answer a question about the Westminster Clock Tower before dangling on a rope afore that famous clock face. If you're brave enough to link your Facebook account up to a government website, you can get yourself listed in a high score table. Imagine. Thanks to the ever wonderful Caroline's Miscellany for reminding us about this horological diversion from last year's 150th anniversary celebrations.